The IP67-certified tablet is waterproof for 30 minutes at a depth of one metre; withstands moisture, sand and dust and fulfils the tough requirements for the MIL SPEC 810G military standard. It is drop-resistant up to a height of 1.8 metres; vibration-proof; resistant to liquids, and salt spray and also holds up to extreme air pressure. The rugged tablet delivers outstanding performance, even in the worst weather conditions and at very high or low temperatures. 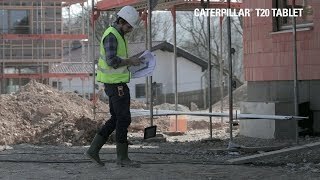 “With the Caterpillar T20 Tablet, we are accommodating our customers’ requests for a robust tablet that they can use in every work situation and in all types of weather. Our customers work in construction, production, logistics and transportation where there is a clear demand for a durable tablet”, says Peter Stephens, CEO of Bullitt Group, the global mobile licensee for Caterpillar. The new rugged T20 tablet is also ideal in areas in which there are occasionally extreme conditions and where a traditional tablet would fail, including large fluctuations in temperature and air pressure; external stress through sand, dust, contaminated liquids and salt spray. This includes, among other things, the aviation industry, tunnel construction and mining, energy production and shipping. A practical hand strap, a micro USB 3.0 cable, a charger, quick start instructions and a warranty card are all included in the box.